Following two weeks of travelling around Vietnam down from Hanoi trying to see and do as much as possible en-route, I was ready for a few days of rest and relaxation in Hoi An. In fact, the main goal for Hoi An, also my last 72 hours in Vietnam, was to do very little. I had nothing planned that was any more strenuous than eating, drinking, and exploring Hoi An Ancient Town (a UNESCO World Heritage Site), the riverside, and the beaches. Despite this, I did end up doing an eco-tour in Hoi An on my last full day. Friends from Siem Reap had recommended I join Jack Tran Tours for their half day Fishing Village Basket Boat Trip. It probably wasn’t something I’d have done off my own back, but the rave reviews from my friends of a really fun and interesting tour convinced me to give it a go. I was very glad I did! 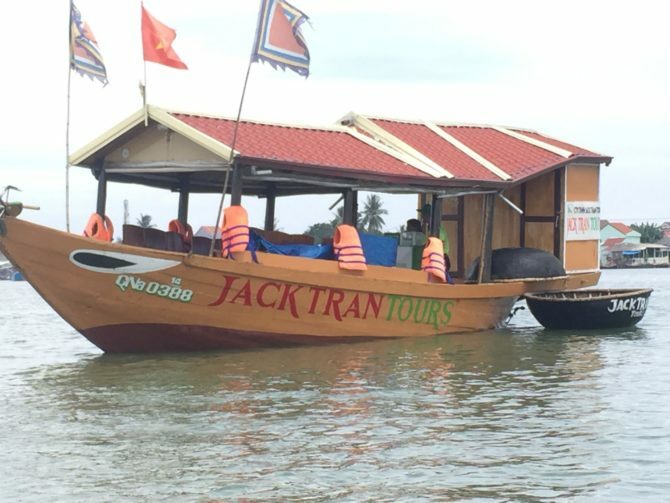 Jack Tran Tours provided me with a complimentary one-day tour which I’ve reviewed below. Read our full Product Review Disclosure here. Jack Tran Tours, a Vietnamese family-run business was founded by local man Mr Tran Van Khoa, a.k.a. Jack Tran in 2005. His vision was to encourage sustainable travel, to protect the environment, and to promote the cultural and social values of local fishing and farming communities. Jack’s committed to benefiting everyone and everything that contributes to the success of his business. His family, staff, guests, the environment, animals, and the many local families who live and work in the villages he operates in. 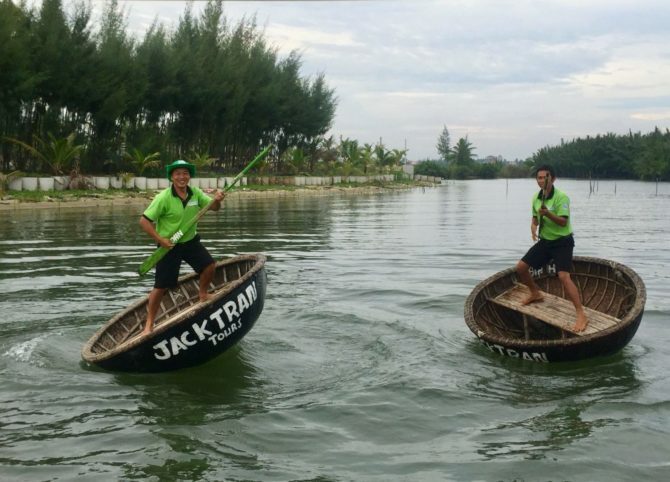 Jack Tran Tours works alongside local Vietnamese people who contribute to the tours and activities by showcasing and explaining their daily lives including traditional fishing and farming techniques. Visitors also get the chance to try out some of these techniques. The morning of the tour I was up bright and breezy but was, unfortunately, a bit late joining the party due to some crossed wires. Entirely my fault as I hadn’t noticed that the email confirming my hotel pickup hadn’t actually sent. As soon as I’d realised my error, I contacted Jack, who promptly solved the problem by sending a minibus to collect me. 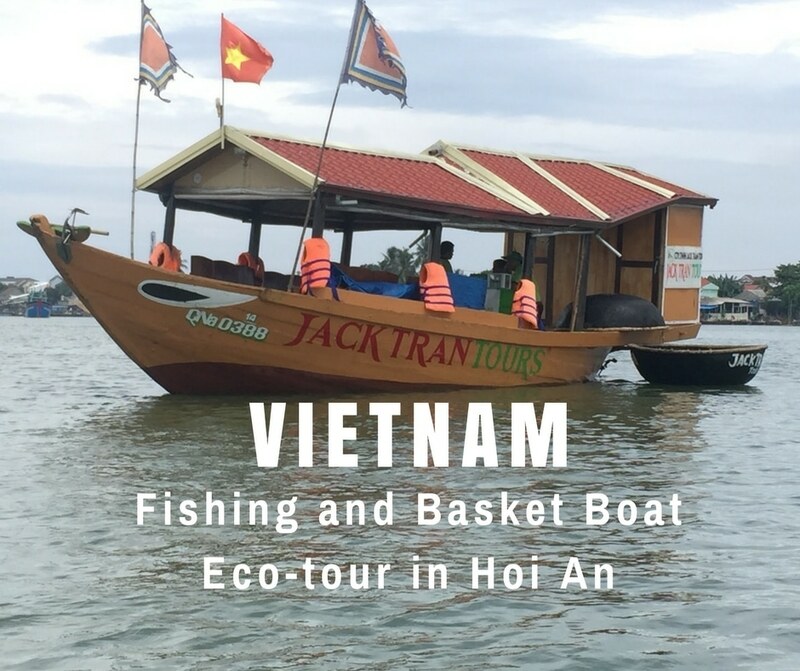 We intercepted the Jack Tran Tours boat on the Cua Dai River after they’d visited a fishing village to learn about the lives of Vietnamese fishermen and their families. Onboard, Yen, our guide for the morning, introduced herself, the captain, a.k.a. Captain Cook, two other crew members, and a couple who were also on the tour. She passed us a water each as the engine fired up again and we started to cruise along the Cua Dai River. 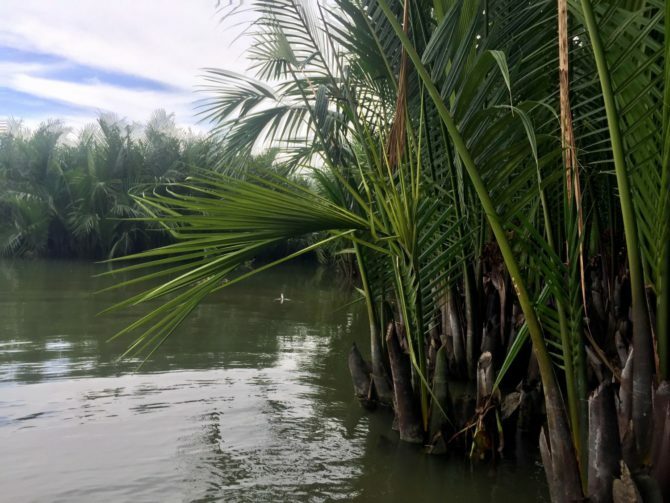 We headed towards an area of the river that lined with water coconut palms and dropped anchor near some coracle basket boats called thung chai. The three crew members jumped in a boat each and demonstrated how to paddle whilst Yen explained about them. They were traditional Vietnamese basket boats of woven bamboo made watertight with buffalo dung and tar. Each boat takes 2 weeks to make and can last for five years providing they are re-tarred every year. The small circular size means thung chai boats are more stable than more traditional shaped boats. This helps them navigate the waterways and prevents them from sinking during a tropical storm or typhoon. Another reason for their small size is because a tax is charged on all larger boats as well as all those that go out to sea! Once we’d learnt all about the basket boats, the crew put on an entertaining, crazy Gangnam Style dance show with the boats. Then it was our turn to have a go at paddling and to be subjected to a quick spot of dancing too. Bing, my boatman, found it hilarious to make me shriek as I clung on for dear life whilst he spun the boat round and round, and up and down in circles. We had life jackets on though and all the crew knew what they were doing so I’m sure we were safe during their antics. Bing paddled our boat back towards the bigger Jack Tran Tours to pick up Yen. We then turned and followed the other basket boat towards the water coconut palm-lined waterways. We skirted the edge of the waterways as Yen explained how important the water coconut palms were and the many uses they had. Local villagers use the palm fronds for the roofs of their houses, whilst their roots help stop riverbanks eroding. The palms are also used as a safe place to store boats during tropical storms and typhoons. She went on to tell us some of the unique and shocking history of the mangrove forests and the people who inhabited them. The Viet Cong used them during the war to hide from American soldiers whose mission it was to shoot and kill them. Later it became clear that very few of those young American soldiers had actually chosen to be there or wanted to be a part of that war. That’s one of the reasons why, when asked, most Vietnamese will tell you they hold no grudges against Americans for the war. 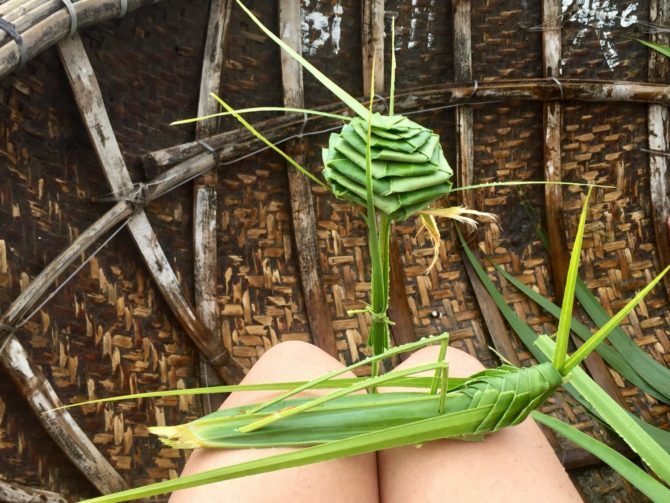 Whilst Yen was talking the boatmen had been busy not only paddling but skillfully fashioning origami shapes from palm fronds. After this thought-provoking history lesson, we headed back to the main boat and Yen brightened the mood by showing us a water coconut fruit. She told us these fruits are often cooked with sugar to make a sweet soup. Back on the tour boat, we cruised the river some more watching the locals go about their everyday tasks as we went. Soon we pulled up alongside a small Vietnamese fishing boat where a fisherman was cast net fishing, whilst his wife steered the boat. The couple welcomed us onboard their boat with huge smiles and laughs. A cast net is a circular throwing net with weights around the edge and is usually around 10 – 12 kg. We watched as the fisherman threw the net with such skill that it opened up into a full circle in the air, before landing on the water and sinking. He then hauled it back in to check if he’d caught any fish. We each took a turn at pulling the net in but the other lady on the tour was the only one who found one; it was tiny so she threw it back. 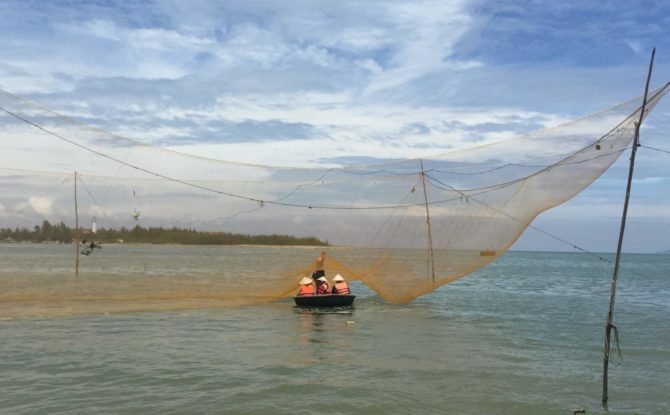 Yen explained that these Vietnamese fishermen throw the nets repetitively all day, every day. As a rule, they keep all fish of any size in the hope of filling their bamboo tray with enough to feed their family with a few left over to sell. Waving goodbye to the fishing couple we headed across the river towards a beach, passing a squid boat on the way. Squid fishing takes place at night and the boat had huge lights set up on top which attract the squid to the surface making them easier to catch. Captain Cook dropped anchor a short way from shore and we climbed into more waiting bamboo basket boats and paddled over to the beach. 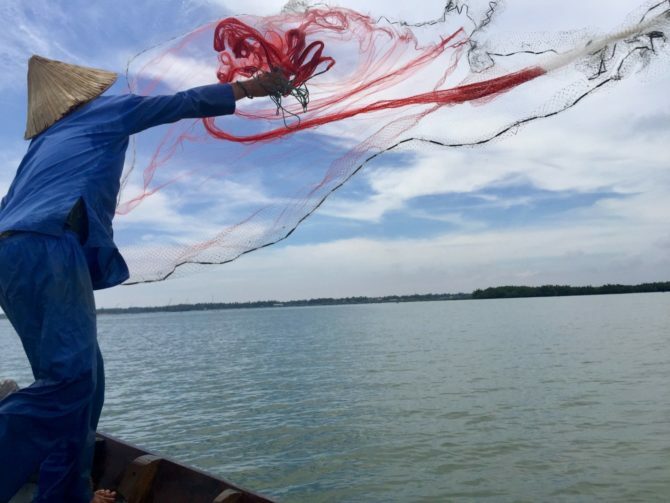 The same fishing couple met us on shore, we donned traditional cone hats and all had several unsuccessful attempts at throwing the circular cast nets. Just offshore there was another fishing net suspended over the river on a huge bamboo frame. The net was square-shaped, weighed about 800 kg and was attached to a bamboo contraption on the beach. It had a type of pulley system that resembled a piece of gym equipment which hoisted the net out of the water. It was manually operated; you sat at the top and turned the wheel with your hands and feet. We each had a go at operating the pulley and watched as the net slowly rose out of the water, a few trapped fish glinting in the sun. To retrieve the fish it was back into a bamboo basket boat and out under the suspended net. We paddled until we found the nearest small gap in the net to a fish and then jostled the net until it fell out into the boat. This one didn’t get thrown back and I assume ended up on a dinner table that night. Lunch was ready when we got back to the Jack Tran Tours boat and I must say Captain Cook made a good job of it. There were shrimp spring rolls, a mackerel, sweet and sour squid, and stir-fried morning glory with garlic. Alongside were rice pancakes, cucumber, salad, and sour star fruit, which Yen showed us how to roll in rice paper to make spring rolls and to dip them in fish sauce. Delicious! A soft drink or large beer was included which we were ready for after our busy morning. All too soon we’d finished lunch and it was time to head back to shore. A mini-bus was waiting and took us to the hotel the couple were staying on. Yen then gave me a lift back to my hotel on her moto as we chatted some more about life in Hoi An. The price of a tour with Jack Tran Tours differs depending on the duration and the activities included. They currently offer thirteen different tours so you’re spoilt for choice. The four-hour Fishing Village Basket Boat tour that I went on cost 1,200,000 VND (£39.12 GBP) per person. Most people travelling in Vietnam go from top to bottom or vice versa. 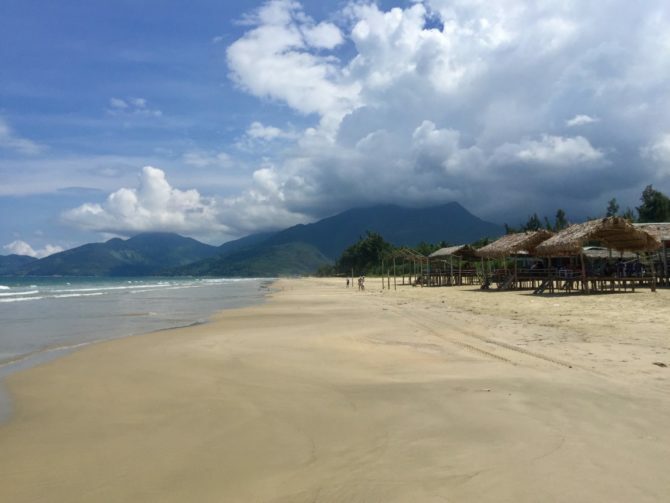 Unless you’re taking a direct flight to Danang just north of Hoi An, you’ll probably head to Hoi An from Hoh Chi Minh City, Nha Trang, or Dalat in the south; or Hanoi, Dong Hoi, or Hue in the north. There are a variety of modes of transport you can use for these journeys including bus, train, taxi, motorcycle, or a combination. Private tours are also available which include stops at other key sights en-route. I didn’t do much research into the details of the various options as I had my heart set on doing the Hai Van Pass. I did, however, find two good websites you can book train and bus tickets from, Baolau or 12Go Asia. 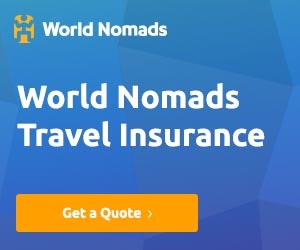 Of course, you can also arrange transport from your accommodation or from one of the many travel agencies in the main towns and cities in Vietnam. There are many agencies offering Hai Van Pass Tours or Top Gear Tour as many have dubbed it after the Top Gear episode about that route. Most offer guided tours where you ride the motorcycle yourself and follow a guide, or where you ride pillion with a driver/ guide. I had no choice but to opt for the latter as I don’t ride motorcycles. Choosing who to do the tour with is a bit of a minefield as there are so many out there. Obviously, my priority as it will be for many others wasn’t so much the price, but the safety. 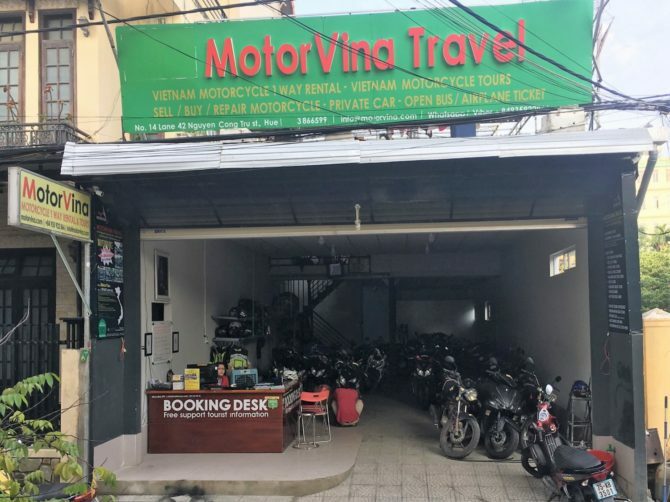 I narrowed it down to a few tour agencies with great reviews and finally decided to go with MotorVina Travel, based in Hue. Motorvina provided me with a partially complimentary motorcycle tour from Hue to Hoi An which I’ve reviewed below. Read more in our full Product Review Disclosure. MotorVina offers motorcycle rental and guided tours (both self-drive or pillion) from Hue to Hoi An. The tour I took was riding pillion with an English speaking guide and included a helmet, fuel, and transfer for my main bag to my hotel in Hoi An. MotorVina can collect you from your accommodation in Hue for their tours, but as I arrived off a very early bus from Phong Nha-Ke Bang I decided to find my own way to the office. When I got there, they gave me a short time to rest then passed me a disclaimer form to read and sign – standard for any activity that involves some risk. The staff sent my main backpack ahead to my hotel in Hoi An by mini-van, fitted me for a helmet and introduced to Yung, my driver and guide for the day. I had a momentary flash of panic when it was time to leave as Yung showed me to a motorcycle, put my bag under the seat and told me to follow him. I realised he was expecting me to ride my own motorcycle…well there wasn’t a cats chance in hell that was going to happen! I explained the confusion and luckily it wasn’t a problem. Five minutes later my bag had been re-stowed under the seat of Yung’s motorcycle, I’d jumped on the back, and we were on our way. 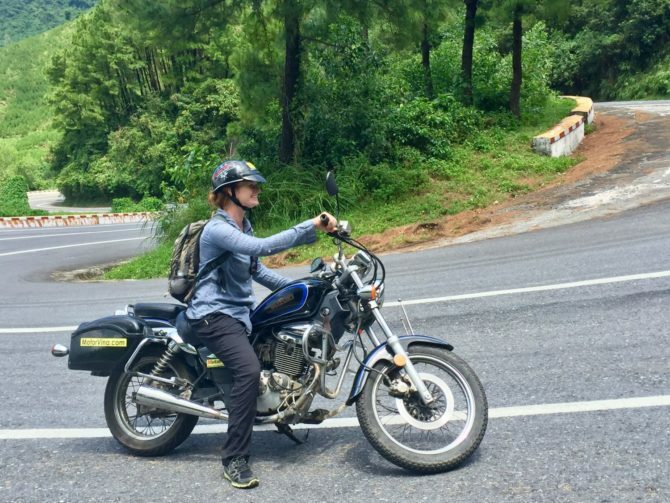 It took 15 minutes or so before I felt comfortable as the moto was different and bigger to the ones I’d been on so far in Vietnam. However, I soon relaxed, sat back and began to enjoy the ride! It didn’t take long for us to get out of the city with its busy roads and into the quieter, much more scenic rural Vietnam. We sped past green rice paddies and through local villages with children playing and animals roaming the streets. About 15 km outside of Hue we stopped at Tam Giang Lagoon, the biggest lagoon in South East Asia. 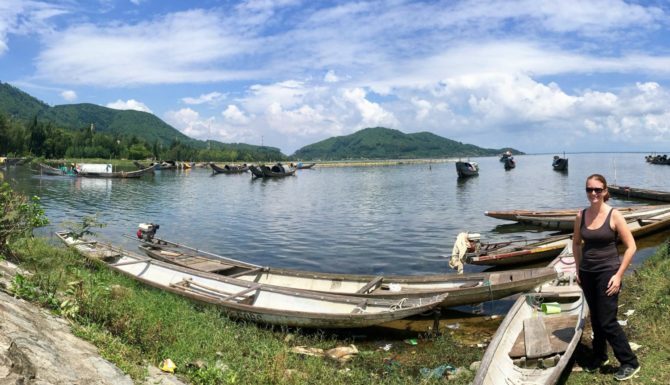 It has a length of 24 km and an area of 52 km squared and is met by three rivers (Perfume, Bo and O Lau). Yung explained that the water is half salt from the sea and half fresh from the mountains. The lagoon is home to many local families, each who are responsible for a small area of the lagoon. We spent a short while watching them go about their everyday life and admiring the beautiful expanse of water. After another 25 km along country and busier roads, we stopped at Elephant Springs, named after the large elephant shaped rock there. We didn’t stay long as I didn’t fancy swimming, but, there were plenty of other tourists and locals who were taking a refreshing dip. For those who don’t want to get wet, there are large flat rocks, platforms, and hammocks to relax with a drink or food from a local stall. 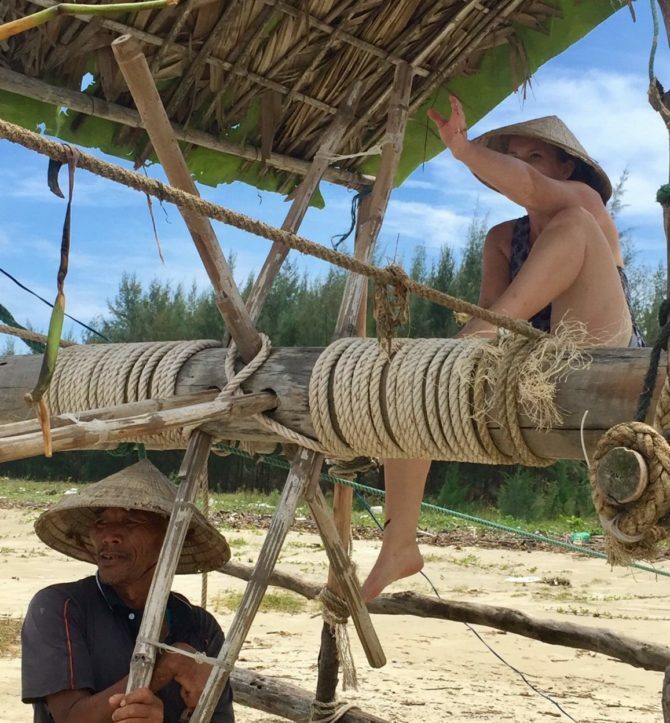 I sat in a hammock which cost me $1 USD (£0.75 GBP) and people watched for a while. Unfortunately when we visited the roofs of the platforms were all covered in blue tarpaulin and were a bit of a mess still from the recent typhoon. By the time we reached the palm-fringed beach of Lang Co Bay I was more than ready for lunch. Yung found me a little beach hut over-looking a virtually deserted beach. There were only a few other motorcyclists dotted about eating and drinking. I ordered some food and whilst I waited, I had a quick wander down onto the white sand beach to the sea. Shortly after I saw my lunch of baked oysters, prawns, and rice was ready so I hurried back to the beach hut to enjoy it. It was fantastic and so fresh if a little pricey (I can’t remember exactly what it cost, but I do recall being a bit taken aback). It was nice for a treat though! After lunch, it was the moment I’d been waiting for and the whole purpose of the motorcycle tour. 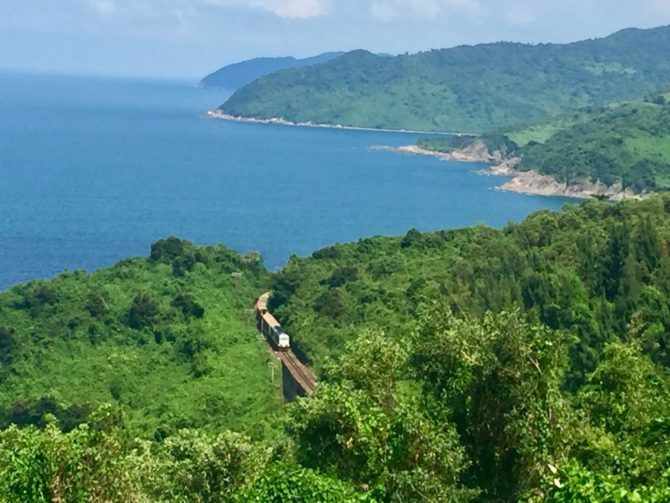 It was time to tackle the Hai Van Pass, the 21 kilometre stretch of road connecting Lang Co Bay with Danang. The ribbon-like road twists and turns its way up and over a spur of the Annamite mountain range. Before we got too far along the pass Yung insisted I pose for a photo on the bike on one of the first deserted hair-pin bends. I struggled to keep the bike upright which only reinforced my decision to ride pillion! Since the Hai Van Tunnel was built in 2005, the pass road is nearly empty except for motorcyclists and die-hard cyclists. Before the tunnel the pass was busy and dangerous; shrines along the roadside are a sobering reminder of those killed in accidents. The hairpins bends can still be treacherous in bad weather but I got lucky with a beautiful clear sunny day! As we started our ascent I was treated to gorgeous views back down over Lang Co Bay. Travelling further along the pass clinging to the mountainside there was one amazing view after another of the jungle-clad mountains on one side and the South China Sea on the other. Yung knew all the places to stop for the best views and happily took photos for me. Before heading down towards Danang we stopped at the top of the pass to stretch our legs and have a quick look at the old French and American army bunkers, and Hai Van Gate and yet more stunning views stretching out below us. After zipping down the other side of the Hai Van Pass it was back onto busier roads as we drove through Danang and past China Beach. Yung gave me the option to visit Marble Mountain, a cluster of five limestone mountains of which you can only actually visit one of them, Thuy Son. At the last minute, I decided not to as I was shattered after my 3 am start that morning. Yung drove me to the Motorvina office when we arrived in Hoi An. My main backpack was ready and waiting for me to collect, then another of the Motorvina guys took me to my hotel on his moto. The tour took about seven or eight hours and cost $49 USD (£36.37 GBP), which I think is good value. Yung also deserves a shout out for being such a safe driver and knowledgeable, friendly guide. 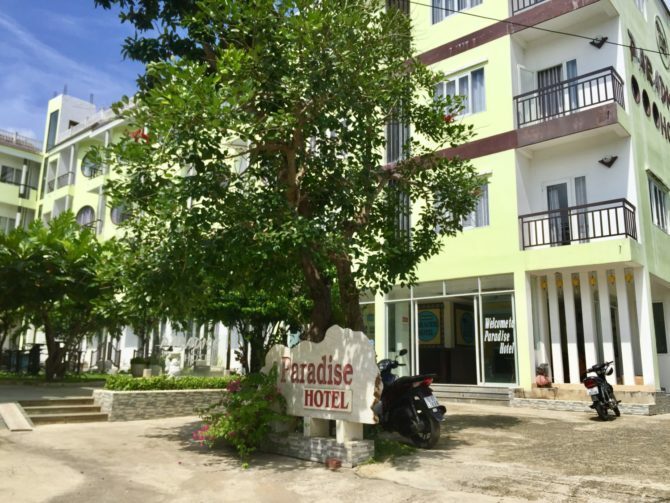 I was hosted for three nights at Hoi An by Paradise Hotel. Read our full Product Review Disclosure here. Tucked away down a quiet street just five minutes walk away from the centre of Hoi An Ancient town is the relatively new Hoi An Paradise Hotel. A friendly receptionist welcomed me, showed me to my room, and gave me some information about the hotel. The hotel has a range of rooms, starting from $9.50 USD (£7.05 GBP) for a bed in a four-bed dorm up to a deluxe queen studio which sleeps eight people for $85 USD (£63.09 GBP). I stayed in a superior triple room with a balcony which cost $39 USD (£28.95 GBP). These prices included breakfast. I was really happy with my room with its large comfy beds and air-conditioning. There was a good hot-shower with complimentary toiletries; a hairdryer, flat screen television, mini-bar, desk and chairs; and tea and coffee making facilities. It also had its own small balcony overlooking the lovely freshwater swimming pool. Next to the swimming pool was the restaurant where I had a very tasty breakfast each morning. My favourite was the Hoi An speciality, Quang Noodles which also came with fruit and coffee. They also served a variety of Western and Asian dishes but I didn’t get a chance to eat lunch or dinner there. Several bicycles were available for guests to use for free which was really handy. I ended up going exploring all over by bike during the day. 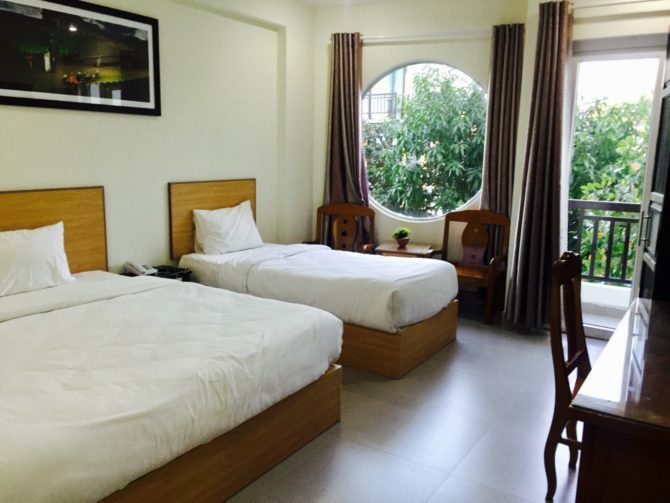 The central location made Hoi An Paradise Hotel a perfect base for exploring Hoi An and the surrounding area. It was a lovely, peaceful spot to relax for my last few days in Vietnam. 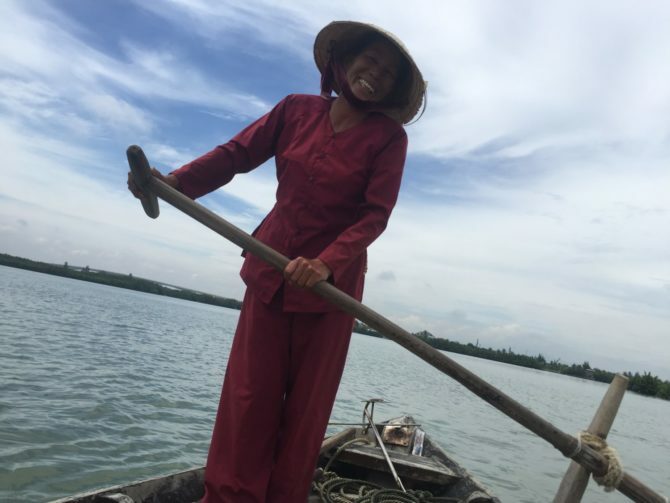 It was wonderful to get the opportunity to experience the daily lives of the fishing communities in Hoi An and to learn some more about their and Hoi An’s history. Yen made the tour even more memorable as she went out of her way to share her in-depth knowledge and to ensure we were all happy and having a good time. The boat crew and fishing family we met were also great fun, we spent a good proportion of the day laughing. 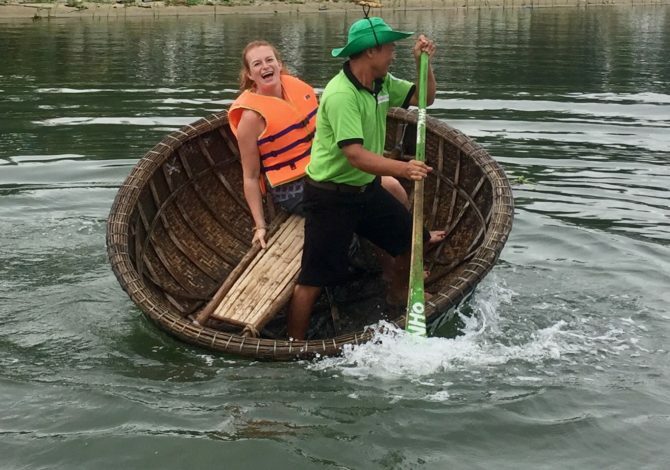 If you fancy trying something a bit different during a visit to Hoi An I’d highly recommend giving this tour or one of their many other tours a go. There’s something to suit everyone and all ages. 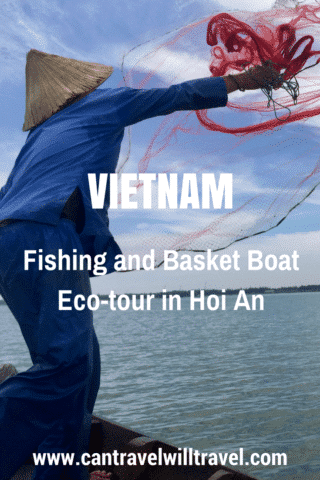 Have you been on an eco-tour of any description in or around Hoi An? We’d love to hear how it went? 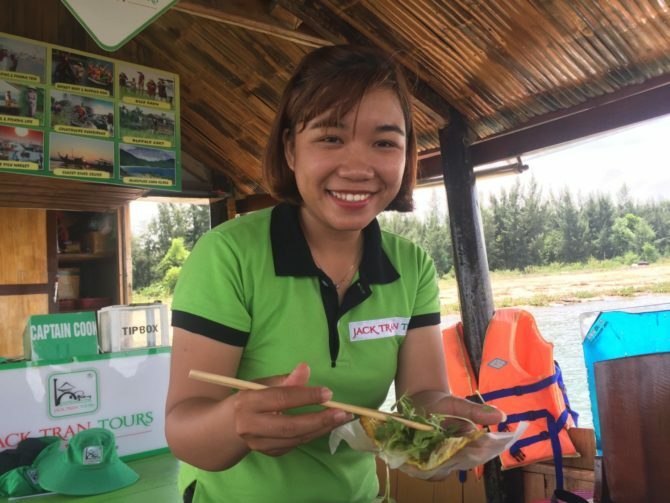 Product Review Disclosure: Jack Tran Tours provided me with a complimentary tour, whilst Motorvina provided me with a partially complimentary tour from Hue to Hoi An. 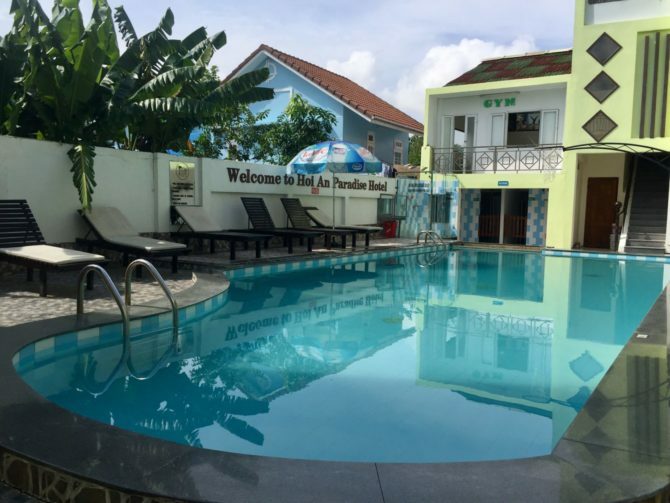 Hoi An Paradise Hotel provided me with a complimentary three-night stay. This did not influence my post in any way and as always I’ve provided balanced and honest reviews.